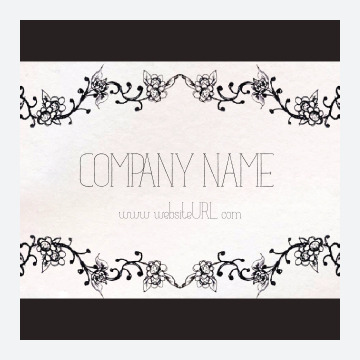 Print elegant, earthy custom stickers with our Ornate Border sticker design template. Crafted by a pro designer and completely customizable with our online design tool, Ornate Border is the perfect sticker for branding elegant businesses, promoting vineyards and wineries, and even providing guest labels and fun favors at weddings. The design showcases your company name and website URL or custom message – whatever you want! – in an elegant, thin font over an eggshell-textured background bordered top-and-bottom with flowered vines. It’s available in five different color palettes plus three edge finishes: round, rounded square, and traditional square. Customize yours with our online sticker make to print personalized stickers today! Custom sticker printing is easier than ever when you use our free online design tool to personalize your stickers to match your brand. Start with our Ornate Border sticker template, select your favorite color scheme and shape, then let the tool you walk you through the editing process: you can change text, fonts, and layout – and even upload your own logo or photo. It’s fast, easy, and free! When you choose PsPrint as your sticker printing partner, you can count on superior stock and high-quality printing every time. We also employ beautiful soy inks to make your designs pop; plus, we have nationwide facilities to ensure you get your stickers as quickly as possible (you can even choose expedited turnaround and shipping). We’re so sure you’ll love the stickers you print with us, we guarantee it! Need something you don’t see here? Our custom printing team is on-hand to make your sticker printing dreams come true. We also offer bumper stickers, sheet stickers, envelope seals, return address labels, window clings, and even wine bottle labels – there’s something for everyone! If you need personalized stickers for your business or event, look no further than PsPrint. We’re your one-stop sticker printing shop!